Bertie Bardell was born in his grandmother’s tea shop at the top of Bread and Cheese Hill, this was in 1925. Much has changed since that time, although the building is still there it has changed a great deal. Bread and Cheese Hill Tea Shop. If you click on this photograph you can clearly see the people waiting to serve refreshments. Bertie Bardell talking about his grandmother's tea shop at the top of Bread and Cheese Hill. "DVT_B011.MP3" from Bardell tea shop by Bertie Bardell. Released: 2011. Track 1. The tea room on Bread and Cheese Hill was run by Alice and Charles Outten who were my grandparents. They had a son called Harvey. If anyone can give me any more information on them or Harvey I would really appreciate it. I was led to believe that nana & grandad ran a whist drive from there. As a little girl I remember the long front room at the front was full of table and chairs, this would explain a lot if it was a tea room. I have a distant memory of a tragic event in Coombe wood which I believe happened in the 1950s or maybe earlier, does anybody know anything about this? I also remember the talk by Gladys Aylward about her time in China and how she was deported from the country in 1949 when it became Communist – how different it is today. I lived in the black and white house just after Coombe woods (going up Bread and Cheese Hill). I lived there from 1961 to 1975 when a car crashed through our front window. Lots of cars had crashed through the front wall but this was the end and we moved to Grangeway. I remember a reporter asking if our house was haunted. I remember you from our first aquaintance in the early/mid 1950s when you lived in Clarence Road. At this time the upper section of Clarence Road was unmade and you could get through to Avondale Road via a nearby grass road on the east side. I remember you and your family moved to a detached house on the east of Thundersley Park Road, opposite a very large house set in its own grounds with in and out entrances and a sweeping drive. The Michael Reed that Linda Lee recalls would not have been at either Benfleet Primary, or King John, given that his birth date in 1941, and our birth dates being in 1946 and 1947. Work and career changes has brought me to the south central coast in south east Hampshire. Well Michael it’s good to hear you are still around, and best wishes. Had a walk along that lane on a recent visit to my half sister Yvonne Barwick of Crescent House, Mount Crescent., ye olde tea house was still there, albeit abandoned and overgrown. Well, Thank You, Pete Robbins. It appeared that I had gotten the name of the Road wrong, but at least, somebody remembered & that’s great, apart from my dear old memories, being slightly frazzled, by the fact that we lived in what we were told was Ex-land Army Building, not -POW camp……Naah – I was there in 1950/2…and there was definitely no containment fences, bad joke, but really, if you are able, then try Land Registry Records….but I did appreciate knowing that. You gave me a descriptive memory of my Little Lane, and the Church atop the Hill, had a wonderful can one say ‘graveyard’, I used to walk around & read all the ‘Headings’. Lonely child d’yer think? No, I was just fascinated by all the folk that had lived here long ago. Linda, I used to live in an old one bed bungalow at the side of St Peters graveyard with my brother and mum and dad from when I was born in 1943 to 1953. It was my playground. Linda, I think you may mean Church Rd, Thundersley. The old army pow building (Runnymead hse) has gone and Kingston School now stand in its place and also the old post office has been replaced by a newer one and the little sweetshop is no more and St Peters church had a modern extension added on in the 1960s but still looks lovely. But Thundersley is much more built up and busier than in the 40s and 50s i’m sad to say. I have read with great interest the memories of School & Thundersley…I lived down Church Lane in the Ex-Land Army buildings, in 1951(sort of Boarding Hse) & also attended Shipwrights School, but I left, just before the School was used as a Refuge centre, when Canvey Island was flooded. Our Headmaster was a Mr. Evans. P.E.teacher Miss Elliot-Sewing Mrs.Cordon, English Mrs Alexander. We had 4 Houses.DeVere DeLacy Orange & Essex… had a Marvellous time..anyone attend during the early 50’s. We had a visit from Gladys Aylewood-? Inn of the 6th Happiness. I now live in W.Australia. Church Lane had a Post Office, one Sweet Shop, and a Beautiful Church atop of the Hill, anyone remember this area? I remember all the shops mentioned above. I was born a Reed in a bungalow called “Trees” down in the woods below Bread and Cheese Hill. I had three brothers, Michael, David and Tony. Michael was born in 1941 and David in 1944 and both went to King John’s School. Both our parents worked on Eastern National buses during the 50s and 60s. I never heard of another family called Reed locally. My auntie and uncle owned the hill top Cafe tea rooms from the 1930’s – 1980. Their names were Alice and Charlie. Charlie also was the milkman with his horse Henry. Sorry different Reed I think! Too many ways of spelling it, depending where it originally came from I think. I remember a little old lady, living in a cottage down there, I will try and remember her name with a little help from my 91 year old Dad. Have to catch him on a good day nowadays though! I used to stand on Coombe Hill and throw Sweet Chestnuts in their prickly shells, wild rose hips and Hawthorn Berries at vehicles as they laboured up Bread and Cheese Hill, then run and hide if anyone stopped and got out. The old ladies cottage was ‘Safe Harbour’ and she always had lots of home made goodies to give us too. probably very late 50s to early 60s. Michael Reed, did you have a brother named David and lived down in the deep part of Coombe woods in a bungalow? If so me and my brother used to play with Dave, we lived in the north side of the woods in Rhoda Road North. My brothers name was Graham born 1950, the only David I knew who also lived in Coombe Woods, Mum used to work at Hobsons uniform factory, on the corner of Kenneth Road. If it’s the same David then I also played with him. Did he go to King John School (Shipwrights)? I was born 1947 for comparison. Carol, Yes it was Thundersley Park Road, though some maps seem to show it as Hill Road, with Thundersley Park Road joining it below the Hay Field below Jarvis Hall? Confusing or what?? Michael, The David I knew was born around the mid 1940s and had an elder brother, their name was Reed, may have had a different spelling. They lived in the bungalow deep down below in the woods that you can see when you stand on the roadside near the top of bread n cheese hill, I seem to recall that their parents may have worked on the buses . PS I was born in 43 and my brother Ken in 45, all used to play there in early to mid 1950s. The cafe that was a grocers in the 1950’s was called Jordans, which was on the opposite side of the road to Mrs.Atkins little shop. Was that road Thundersley Park Road? Then further along on Kiln Road was another smallish shop called The Creamery next to the Bread and Cheese off-licence. On the other side of Kiln Road was Lester’s sweet shop and Mr. Coleman’s butchers shop which I lived above. Does anyone know what happened to any of the owners of these shops? 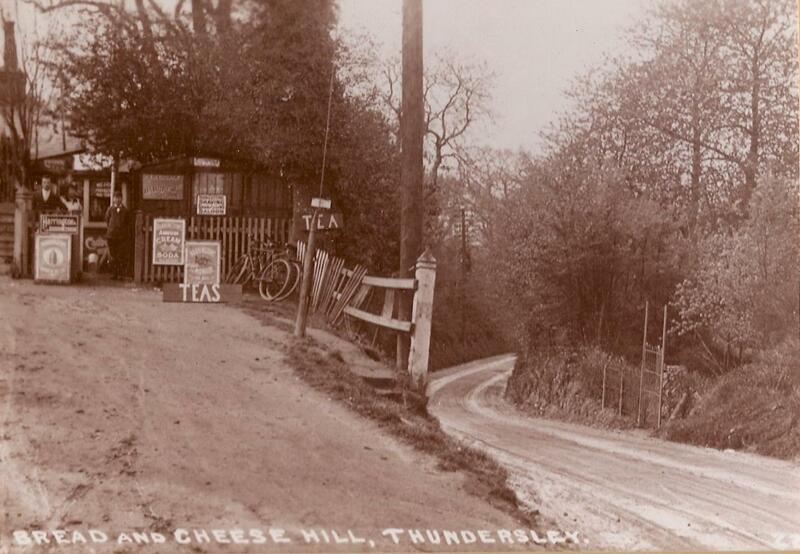 The picture of the Bread and Cheese café has been taken from the other side of Thundersley Park Road, Where I used to live (though much further down). I think the Café was a grocers in the 1950s? Opposite and slightly in from the corner was a very tiny General Store run by a Mrs Atkins. 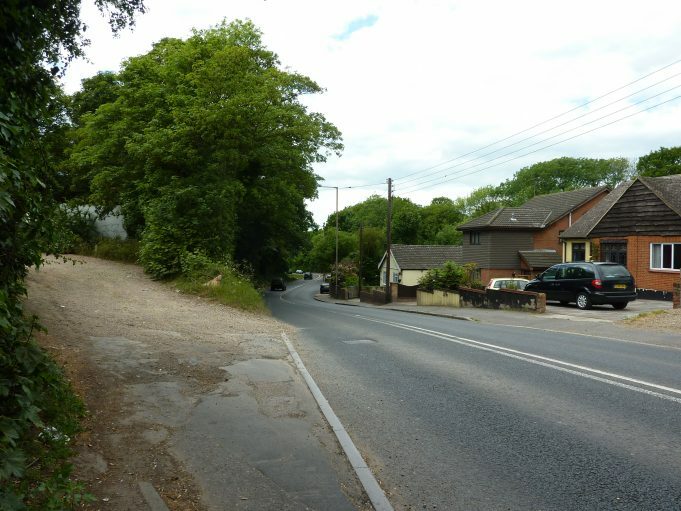 As kids, we also picked Bluebells, collected sweet chestnuts and swung from the trees in Coombe Woods opposite here and further down Bread and Cheese Hill. Not only the bluebells, we used to collect the fallen horse chestnuts to make into conkers. Bucket loads of them. Try and tell people today what you do with conkers and they think you’re mad!! When we were kids we used to go into the woods on the right of this picture and pick bluebells, it used to be carpeted by them. I’m in Canada now so I don’t know if they are still there. Yes, the blue bells are still there, but we are not allowed to pick them any more.